If I have to cook for my entire family, I'd need to use more than one MasterPan or a different pan altogether. 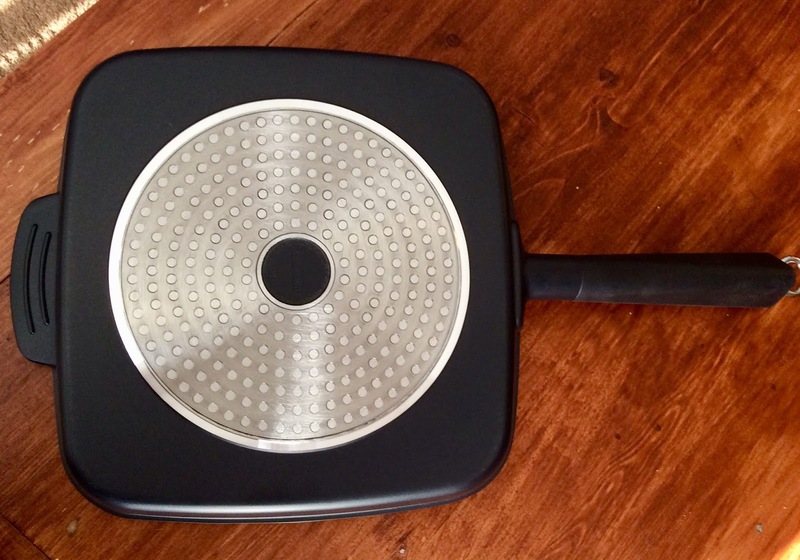 But if I want to cook for one or two people, a MasterPan divided skillet is ideal. I've used the MasterPan skillets several times since receiving them. The deep grill line sections on the pans create beautiful grill marks, which I'm a big fan of. 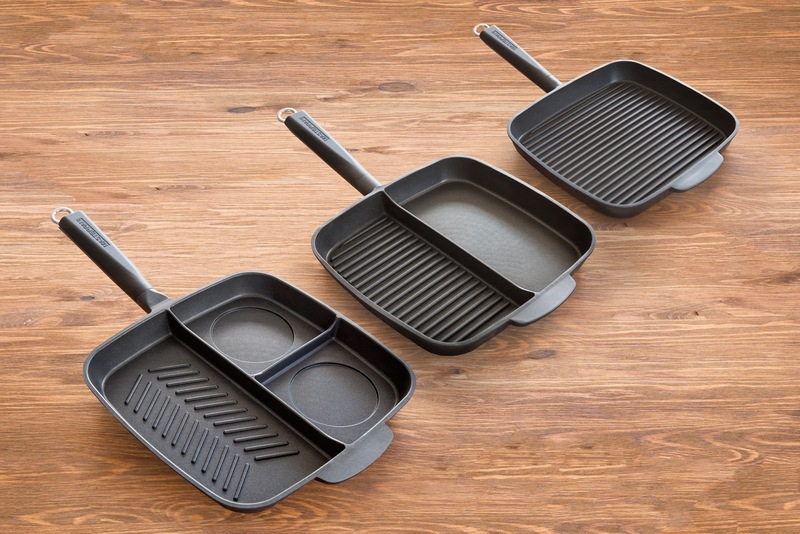 The skillets are made of cast aluminum and two layers of non-stick coating. They are very sturdy and the high quality construction of these skillets is visible. Being able to cook three strips of bacon and a couple eggs for breakfast without using more than one pan is quite convenient. The same goes for cooking vegetables on one side and meat strips on another. An induction base on the bottom of each skillet ensures that heat distributes evenly. 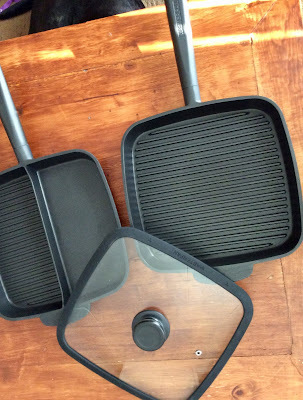 Each skillet has a detachable handle. By removing the handle, you can put the skillet in the oven to keep food warm. 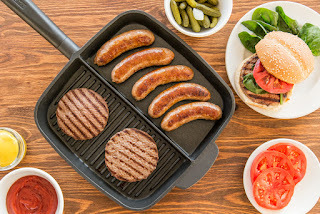 Because the grill lines on the skillets are high, the fat and grease from the food is trapped in between the grill marks. That means you will have very little fat or grease on your food when it's fully cooked. If you are interested in MasterPan but you aren't quite sure you want the skillets to have divided sections, a MasterPan Deep Grill is available. It's a large skillet with no dividers but, otherwise, it's made the same way as the other skillets. MasterPan has a square glass lid that fits all their skillets. You don't have to try to pair a lid up with a skillet because the lid will fit on any of them. The lid has a steam vent and a silicone rim. It's indicated that these skillets are dishwasher safe. I can't personally vouch for that, but cleaning them via hand is easy. I don't have to scrub and scrub. To keep food from going from one section to another, I use a small spatula if I need to stir or flip whatever I'm cooking. Consider me a fan of MasterPan! I love this little pan. I'm always looking for something smaller when I'm cooking for just myself or two people. This really would be perfect. Thanks for sharing.